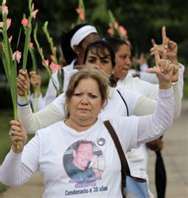 Ladies in White is an opposition movement in Cuba consisting of the wives and relatives of jailed dissidents. They are fighting to curb abuses they say family members suffer during incarceration. The group formed in 2003 after 75 political prisoners were jailed. Dressed in white – the colour of peace -they march to Catholic mass each Sunday to pray for human rights and the release of relatives and loved ones in prison. While the group has been meeting across Cuba for years, a particular demonstration in Havana on August 23 proved to be momentous. When a plain-clothes police officer came to break up the women’s march, some nearby people defended the women and forced the officer to leave in search of backup. This was not the first time the group have been aided by bystanders but it was the first time such an action was caught by video camera and uploaded to YouTube the next day. Two days later Amnesty International published a call to stop the repression of the Ladies in White (see WVoN story). According to a report released by the Assembly of Cuban Resistance “Cuba: Violent Aggressions Against Women, Human Rights Defenders,” police and government officials have violently attacked individuals and groups of female political dissidents on at least 25 occasions this year. Sometimes the attacks happened while the women were engaged in nonviolent protest, and other times while they were with their families at home.